2018 Enfield Classic 500 Stealth Black. Picture credits - Enfield. Submit more pictures. There�s a time to ride, and a time to call it a day, sit back and watch the universe blaze away in all its glory. To remember the joys and pains of the day gone by, and look forward to what tomorrow brings. There, amidst the dark, discover the other half of your riding story, with a motorcycle that�s slept under the night sky since 1901. Embrace the dark with the new Classic 500 Stealth Black. Ask questions Join the 18 Enfield Classic 500 Stealth Black discussion group or the general Enfield discussion group. Get a list of related motorbikes before you buy this Enfield. Inspect technical data. Look at photos. Read the riders' comments at the bike's discussion group. And check out the bike's reliability, repair costs, etc. 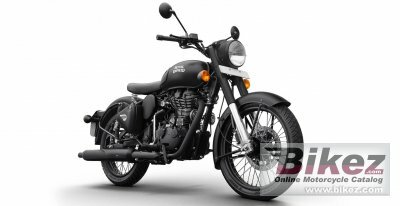 Show any 2018 Enfield Classic 500 Stealth Black for sale on our Bikez.biz Motorcycle Classifieds. You can also sign up for e-mail notification when such bikes are advertised in the future. And advertise your old MC for sale. Our efficient ads are free. You are also welcome to read and submit motorcycle reviews.